During World War I miners often dug tunnels, and placed mines in them. During World War I miners often dug tunnels, and placed mines in them. The main objective of these mines was to destroy part of an enemy trench, and then attack during the confusion. Soldiers eventually developed strategies for discovering enemy tunnels. One method was to put one end of a stick in the ground, and the other end on your teeth to feel vibrations. Another method was to sink a water-filled oil drum into the floor of the trench, and lower your ear into the water to listen to noise being made by people tunnelling. It took a long time to dig a tunnel. Sometimes it took a year. Occasionally miners would dig into their enemy's tunnels, starting an underground fight. Typically there would be 4 tunnellers working at the face (one of whom would be resting), plus 2 tunnellers mates handling trolley, air pumping and preparation of timber.Generally infantry working parties were employed to remove the spoil from the shaft heads and dispose of it. (One foot run of subway created 70 sandbags of spoil). At any time a Tunnelling Coy would have several digging parties working towards each other. One shift resting or on light duties out of line for 4 days. Shifts normally worked underground for 8 hours in every 24 hours. The 16 hours 'off' included moving into and out of the line. 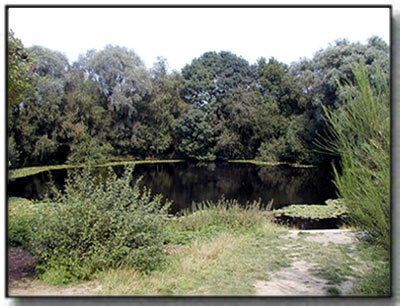 The site of the largest of the 19 mine explosions detonated to signal the start of the Messines phase of Third Ypres, the 'Pool of Peace' - Spanbroekmolen - was formed by a 91,000lb ammonal explosion set off at 0310 on 7 June 1917 underneath one of the then highest German front-line positions on Messines Ridge. Work began on laying the mine in December 1916 and continued right up until a few hours before the mine was detonated, when the actual charge was placed and primed. Following the war, in 1929, there was concern that all of the mine craters left by the offensive were being lost as, each was being reclaimed by local villagers. This led to the purchase of Spanbroekmolen by Lord Wakefield and its renaming as 'The Pool of Peace'.It has been left ever since as a memorial.It is now owned by the 'Toc-H' museum in Poperinghe. Early in the June of 1915, Mr Arthur B. Clifford was appointed to the rank of Lance Corporal and sent out to begin the training of officers and men in the use of mine rescue apparatus, and was solely responsible for this work until October of the same year. 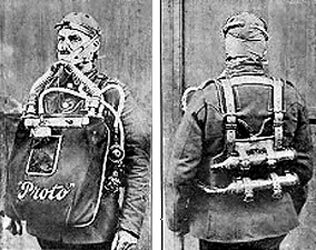 During this time his work was carried out under enormous difficulties in that he was asked to train 3000 mine rescuers in a month with only 36 sets of PROTO being available in the country at the time . 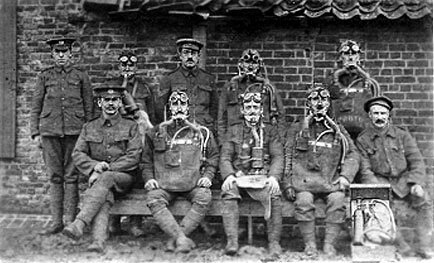 In June 1916 (the peak month), along the line of the British front, the British fired 101 mines or camouflets; the Germans fired 126; a total of 227 in the month. The site of the largest of the 19 mine explosions detonated to signal the start of the Messines phase of Third Ypres, 91,000lb ammonal explosion was set off at 0310 on 7th June 1917 underneath one of the then highest German front-line positions on Messines Ridge. The sound of the 19 mine explosions was apparently heard as faraway as Dublin, and in Downing Street itself.It was considered the loudest man-made sound until that point. During the proceedings of the annual dinner of the North Staffordshire Institute of Engineers at the North Stafford Hotel, on Monday evening, Sir John Cadman, K.C.M.G. presented the Meritorious Service Medal to Sergeant Clifford of the Royal Engineers, who was assistant instructor at the North Staffordshire Mines Rescue Station. Sir John said he considered a great privilege to be asked to present that medal, particularly because it related to a subject he was particularly very much interested in. Sergeant Clifford acted as assistant to his father as instructor of the North Staffordshire Mines Rescue Brigades, from the beginning of 1912 up to the end of 1914, when he went out to Mexico, to undertake similar work there. The particular work he did in Mexico happen to be more or less connected with work that he (Sir John) was associated with, that was, in connection with the development of the great oilfields there. He need not remind them that emergencies arose in those oilfields. On one occasion one of the great Mexican wells took fire, and millions of tons of oil were ignited. It was necessary to introduce methods, which were new to science and new to oilfield technology and it fell to one from North Staffordshire to undertake that work.